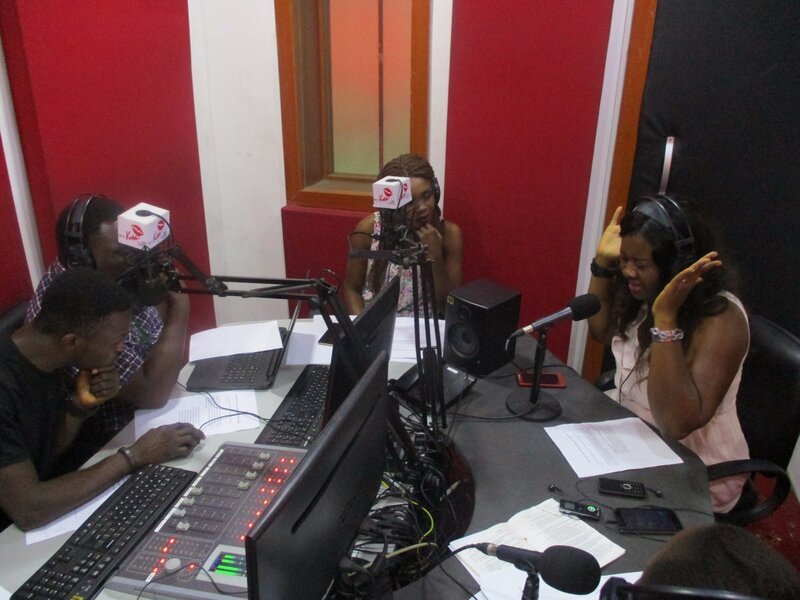 On July 13, 2017, SPACES FOR CHANGE | S4C’s legal team, comprising, Aizighode Obinyan and Victoria Ohaeri, were guest analysts on ‘The Podium’ radio program, aired live on KISS FM 98.9, to discuss the civil, political, social, economic and cultural rights implicated when demolitions and forced evictions occur. The radio program comes at a time when flooding has ravaged many parts of the city of Lagos, and the Lagos state authorities have in response, announced plans to demolish several properties that were allegedly built on drainage channels. Are demolitions right or wong in the first place? S4C proceeds on the premise that sustainable flooding control cannot be achieved through forced evictions and demolitions which leave a greater percentage of the Nigerian population vulnerable and homeless, thereby exacerbating urban poverty. Citizens erect residential and commercial structures on unapproved sites only when they do not have access to land and adequate and affordable shelter. Similarly, the ease with which citizens erect structures anywhere is also a sign of lax regulatory enforcement. Furthermore, disportionately targeting structures erected in informal settlements (for demolition) smacks of discrimination, and resembles a deliberate strategy to remove the poor from city centres. Why do we have demolitions in the first place? What procedures should the government comply with in conduct of demolitions? When it happens, what remedies are available for displaced persons? ‘It is not every house that is illegal. Illegality of a structure is determined and pronounced by the law courts. When agencies describe a structure as illegal, the question begging for an answer is – ‘How did you determine that illegality?’ Agencies can merely allege that a structure contravenes certain guidelines. They need to obtain a court order before they can evict. That way, an independent tribunal is afforded an opportunity to determine the legality or otherwise of a structure, and review other surrounding circumstances of the case. The Land Use Act, 1978, makes robust provisions regarding how authorities can revoke interests in land and compensate those affected by the revocation. The State has the power of eminent domain i.e. they have the right to acquire private property for public purpose e.g. roads, general hospital, industry, or other projects that will benefit the generality of citizens. However, this right is not absolute. There are limits. First step is the process of revocation of prior vested rights (customary, statutory, or even equitable rights) in the land. In this case, notices must be given. The enumeration of persons to be affected must be done. The consideration of the size of compensation due to persons affected need to be determined. There is the need to undertake a detailed valuation of losses that will ensue and other statutory processes that need to be followed. Section 44 of the Constitution of the Federal Republic of Nigeria, 1999, requires authorities to pay compensation promptly, and any person claiming compensation should have right of access to the courts for the determination of what amounts to fair compensation. Are these provisions in the laws practicable? Have you witnessed successful litigation on the determination of proper compensation with regards to government acquisition of property? There is a plethora of cases where the conflicting interests in land have been successfully determined by the courts, compensation awarded and resettlements ordered. In Alhaji Abba Sheik Vs. Borno State Government, the acquiring authority successfully established it had duly served a revocation notice, a stop work order, and notice to remove the structure. The notice of revocation must also specify the public purpose for which the land is being acquired, and this motive must be expressed as public interest. It must also specify, with certainty, the property, subject to the acquisition. Any notice of the acquisition with vague definition of the property and subject to different interpretations as regards the precise location of the property provides a basis for legal challenge and invalidation. Where the land sought to be acquired is community land, a schedule showing the boundaries, precincts and other identities of the areas being acquired must be attached to the notice. What should government do with regards to property erected on vital state infrastructure such as drainages? How should government handle citizens who build property on public infrastructure and/or who fail to adhere to notices of contravention and orders for removal of illegal structures? Are these not threats to urban development? State actors should perform their duty and enforce regulations. It is their duty to prevent fraudulent issuance of licenses and permits which often lead citizens to erect structures on areas delineated for public use. In doing so, they must strictly adhere to due process and statutory safeguards. For instance, the “Lagos State Urban and Regional Planning and Development Law, 2010”, requires authorities to paste contravention notices. Two (2) or ten (10) day notices commonly pasted by State agencies are insufficient to fulfill this purpose Also, that law stipulates timelines for citizens to raise objections to contravention notices. Authorities rarely consider these objections. Indeed, citizens should be educated on rules guiding zoning of areas for various uses, and allowed the opportunity to engage with State authorities. Aside that, the erection of structures on unapproved places, including the rapid spread of slums in Nigerian cities should be seen as a symptom of a bigger problem. The bigger problem requires a look at statistics such as the World Bank statistics on poverty in Nigeria which shows that over 100 million people out of the estimated 180 million citizens live in poverty. This shows that the poverty rate is high. There is also a massive housing deficit in Nigeria. With Lagos State being a mega-city with a population of over 21 million people, this means the housing crisis is even more intense. When you have a concentration of poor people in a city that cannot provide adequate shelter for them, there is a problem. The result will be slums. If you have a population with majority who cannot afford housing available in the State, there should be policy directive to close the housing deficit. If this is not done, there will always be people who will live anywhere. What should the government do to remedy flooding which is a concern and basis for demolition exercises? Over the years, SPACES FOR CHANGE has been studying the pattern of demolition and forced evictions in Lagos. We have established that demolition exercises disproportionately target locations occupied by the urban-poor. When flooding occurs at elite locales such as Parkview Estate, Ikoyi, Lekki, etc, the demolition exercises are not conducted in these areas, but rather take place in Oshodi, Agege, Badia, Makoko which are mainly inhabited by the urban-poor. The demolition of Maroko (now Lekki Peninsula) took place in 1990 with the government saying that the area was prone to flooding and as such, not habitable, and environmentally insecure. Maroko at the time was occupied by over 300,000 people who were brutalized and forcefully evicted, which paved way for the elite to take over the entire area, and rename it Lekki Peninsula. Till this day, Lekki Peninsula continues to face much worse flooding crisis, but the governmental response has been totally different. Combating the problem of blocked drainages requires proper waste management and community enlightenment programs. They can use media organisations or launch campaigns against improper disposal of waste. Demolition of structures and inflicting pain on people is not synonymous with development. Human beings have daily needs that must be met and it is an obligation on the State to provide an enabling environment for the pursuit and attainment of these needs. Nigeria should borrow a leaf from South Africa’s Cape Town which has a very dense slum settlement living across from elite sections of the city. The city authorities have not demolished these settlements because they consider that demolition would only worsen poverty levels of the displaced and lead to higher levels of crime within the entire city. What happens to people who cannot afford litigation costs and retaining a legal professional? Litigation is not cheap, and is tough, especially on housing issues. There are many issues to deal with including admissibility, jurisdiction, and justiciability. In SPACES FOR CHANGE, we deal with the issues from a human rights perspective. However, most courts would look at demolition as an issue of determining title to land. S4C resorts to litigation on behalf of individuals and communities displaced in breach of the provisions of Section 44 of the Constitution of the Federal Republic of Nigeria, 1999. S4C also uses litigation to try to avert demolitions, or to obtain redress when the demolitions have already occurred. In these situations, S4C frames them as human rights issues which the courts have jurisdiction to determine. Aside litigation, dialoguing with different government departments is a core part of our advocacy strategy. What steps would you advise citizens who are affected by demolitions or have their rights violated to take? Citizens should not be afraid of the courts. More citizens need to embrace litigation when their rights are violated, and also file claims for damages to regain losses suffered. Irrespective of expenses incurred in litigation, citizens need to recourse to law courts. They can also benefit from the free legal services offered by state agencies such as Lagos States’ Public Advisory Centre (PAC), Office of the Public Defender, the Directorate of Citizen’s Rights. In these places, they can get free legal representation and access to the courts. S4C also works to galvanize citizens to engage elected representatives. It is an obligation and we make them understand that. PreviousPrevious post:GOVERNOR ROCHAS, STOP OWERRI MARKET DEMOLITIONS NOW!NextNext post:FACTSHEET 03: DO FATF RECOMMENDATIONS INFLUENCE RESTRICTIVE LEGISLATIONS?